Trophy Hunters Alberta is well known for our ongoing elk hunt successes. Please visit our Trophy Hunters Alberta Elk Photo Gallery for pictures of some of our successful elk hunters. Over the years, our three largest bulls have been harvested during our archery elk rut hunts, when the elk are actively responding to the bugle and/or cow calls. Typically during the archery rut hunt, the bulls remain relatively undisturbed and opportunity rates are frequently 100%. It is not unusual for THA hunters to achieve 100% opportunity during our archery elk rut hunts and, on a couple of occasions, our archery elk rut hunters have achieved 100% kill success. 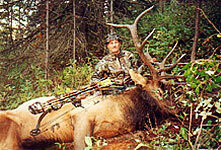 We have the territory and the expertise to provide you with a serious archery elk hunting experience. THA offers pre-rut hunts from late August to the middle of September. These hunts are conducted in WMUs 326 & 330 before the rifle season starts around September 17th. This is a good hunt to take advantage of Elk in rut before the opening of the rifle season. This zone is forested with numerous logging and oil well roads. We may use remote camps or local motels / chalets depending on where the animals are located. THA offers rut hunts during the last two weeks of September. We may also provide a later hunt in October to access the elk during their second or third rut. These hunts are conducted in WMU 304. This zone is in the rolling Porcupine Hills south of Calgary. We typically use local ranches or motels obtain access to hunting area by 4x4.